TRS Motorsports External Oil Cooler Adapter / Heat Exchanger Delete for all M96/M97 Porsche. 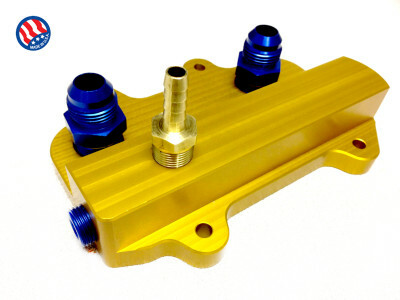 This adapter allows the use of an external oil cooler and eliminates the water-oil cooled heat ex-changer factory part, providing the vehicle lower oil temperature. Improve oil cooling capabilities with our heat exchanger delete kit. Eliminate coolant/oil intrusion due to failure of the stock oil cooler. By utilizing our heat exchanger delete and adding an external oil cooler, you can significantly decrease temperature of the engine oil. Does not come with -10 hose. Does not come with external oil cooler. We are currently developing external oil cooler kits for each vehicle for use with the heat exchange delete kit. Some of our clients have successfully performed the installation of our oil cooler / heat ex-changer delete kit and we have complete faith that you can also complete this project. However, we must urge you to consider whether you are equipped with the appropriate tools, time and mechanical inclination before taking on this project yourself. If you are not sure about whether you can handle this project yourself then we suggest you have this service performed for you at a reputable shop if you are not near our facility in Coral Springs, Florida. While we can provide step by step instructions for installing your Oil Cooler / Heat Ex-Changer Delete on your Porsche we suggest you consider whether you are equipped with the appropriate tools, time and mechanical inclination before taking on this project yourself. Some of our clients have performed this service themselves and we have complete faith in our customers. If you are not sure about whether you can handle this yourself then we highly recommend you contact us at 954-345-7877 to make an appointment. If you are not anywhere near our facility in Coral Springs Florida and can not transport your car to us then we highly recommend you visit our list of reputable independent TRS installers and distributors.